•POWERFUL LITHIUM BATTERY: Powered by a PANASONIC 18650 Lithium-ion battery , which has quality assurance as fundamentally avoid Battery fault and make the battery’s life longer than others. •RANGE: 240-watt high speed motor 36V & 5.8Ah motor that charges in 4-6 hours. A High-performance Motor achieves a top speed of 20-30km/h with a range of 25-28km. •EASY FOLDING – Ideal for travelling holidays and those with minimal storage space,when you want to take our electric bike for holiday, you can travel light, just fold it and put it in the trunk. •ZERO EMISSIONS – The Folding Electric bicycle is 100% electric & emissions free, saving both your wallet & the environment. 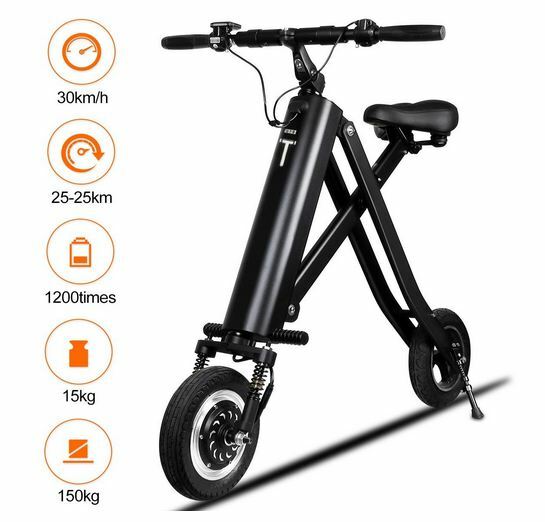 If you love the environment you live,you can protect the environment with our electric bike. 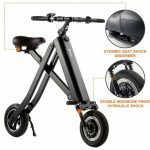 •GUARANTEE: With one-year warranty for the wheel hub motor and the charger，with two-years warranty for the battery. We also promise 100% refund if the products can’t meet your expectations, you’ve no worry using it. Don’t hesitate,if you are interested in our bicycle,try it!